On April 13th, British rock trio Reigning Days are set to release their colossal debut album "Eclipse", via Marshall Records. 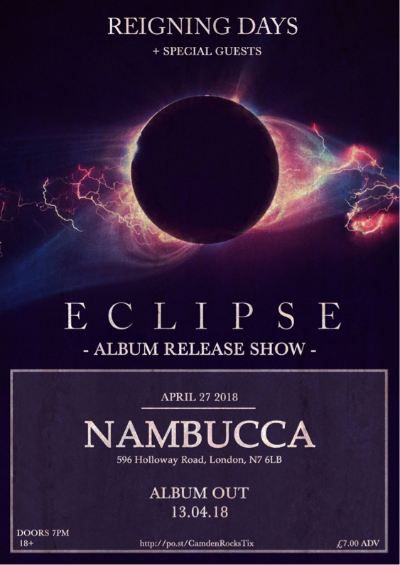 In support of this, they have announced that they will be playing a very special show at London’s Nambucca on April 27th in association with Camden Rocks Presents. Joining them on the night will be Vahalla Awaits which features members of The Blackout and Revoker for their debut show, as well as Towers, Rosen, Gravey, Indya and As Sirens Fall. The band have also been announced for this year’s The Great Escape Festival where they will play The Autonomy stage on Thursday 17th May, then on September 9th they head to Wheels and Fins festival in Kent, which is a three-day event celebrating music and action sports.